I look forward to spending eight weeks this summer at St. Francis Parish in Triangle, VA. The year just keeps on moving! After yet another year of studies, I find myself done with exams, finishing up my self-evaluations, and heading to retreat with a simple question: Now What? For eight weeks this summer, I have been assigned to St. Francis Parish in Triangle, VA. Walking distance from the Quantico Marine Corps base and just off of I-95, St. Francis mixes a large amount of military and government workers with people from far out of town, easily traveling a great distance to be with the friars. These two factors mean that its 2,000 families are diverse in culture and background, coming from all over the country and constantly changing. If that’s not enough, the parish is young and energetic, absolutely teeming with families. When I arrived Saturday for a visit, they had already had two First Holy Communion masses and had one more to go to fit the 150 children in the program. Yeah, that that’s a lot of kids and a lot of young families. Everywhere I looked in its seven, packed Sunday masses were growing families, and they seemed excited to be there. Needless to say, I’m excited to be there as well, and couldn’t be coming at a better time. 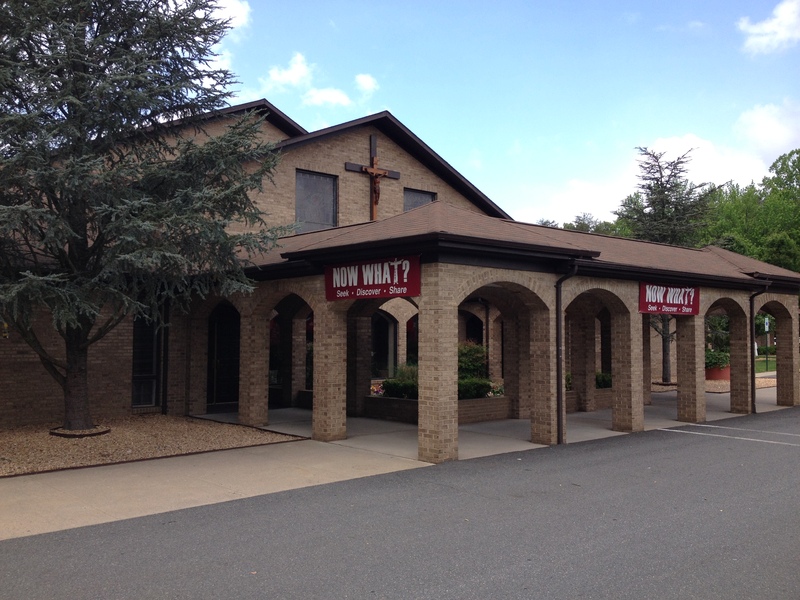 After completing a comprehensive parish-wide survey to assess the needs and strengths of the parish, they recently launched a “Now What?” campaign to reengergize the faithful out of complacency and into the world. The first phase, Seek, challenged parishioners to identify their gifts, to articulate their understanding of God, and to determine what was holding them back from taking the next step in their faith journey. The second phase, started during Lent and continuing throughout the time I will be there, is called Discover: “we will ‘Discover’ ways to respond to our NOW WHAT? question through homilies, a parish mission, ministry showcases, a bulletin column, our website, and social media, among other things.” New initiatives are being started, old habits are being questioned, and everyone is being challenged to discover something new about the Church. So what does that mean for me? Well, after meeting with the pastor and lay pastoral associate, it looks like I’ll be pretty busy! Teaching will be a strong component, as last summer, but I’ll be adding a new course to the “How Do Catholics Read the Bible?” course I taught in Camden. Entitled, “Catholic Bootcamp,” my goal is to teach an “everything you always should have known about Catholicism but were afraid to ask” class, covering the basics of the Bible, Catholic theology, liturgy and sacraments, spirituality and prayer, history, and social teaching in six weeks. Ambitious? You bet! But our tradition has really failed over the years to evangelize and catechize our own people, and many adults honestly don’t know their faith. I see it as a major calling of mine to make the Catholic faith an interesting, engaging experience for everyone. The message is great, but the delivery needs some work for sure! And while here would have been a great place to end this post, having given a summary statement and used the title of the blog in a way to bring everything full circle, I continue to type. That’s because the answer to the question at hand has actually nothing to do with parish ministry and everything to do with what I’ll be doing before I head out. You see, what I’m going to do in eleven days is so interesting and exciting that you’ll be asking yourself, with envy and maybe confusion, the entire time I’m doing it, “What Now? !” But not right now. No, what is bound to be the biggest announcement yet on this blog, an opportunity that was inspired by Life From a Suitcase and was hinted at in Spring Break!, will be revealed Friday. It will be unlike anything I’ve done so far as a friar, and yet just a small-scale practice for what I have planned for six years from now. Interested? Excited? Scared? All will be revealed soon enough. You won’t want to miss this one, and you’ll definitely want to be around for all posts (and videos) that follow that week. See you Friday…! Looking forward to meeting you, Casey! Oh my goodness, that sounds like a vibrant place to be! Sounds like you and the parish will be blessed to get to know each other this summer! Enjoy!